Making a light for a friend’s kid (birthday present) modeled after the Darbin Orvar fairy light. I used a ROS to 220 grit, then put a piece of 220 grit down on my outfeed table and sanded with the grain prior to the 1st coat. Using Arm R Seal Semi Satin (1st time using Arm R Seal). So far I’ve done 3 coats waiting 24 hrs in between, lightly sanding with 600grit between coats and then wiping clean with mineral spirits prior to adding an additional coat. I think the sides look pretty good but the top looks pretty poor. 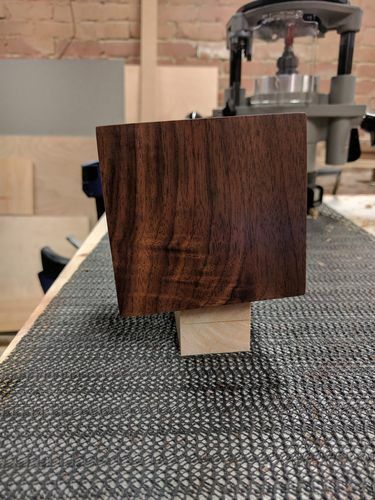 I know my friend won’t care but I would prefer to have it look as seamless as the edge grain if thats possible. I would have sealed it before but at this point additional coats will be needed. The end grain is absorbing the wax. 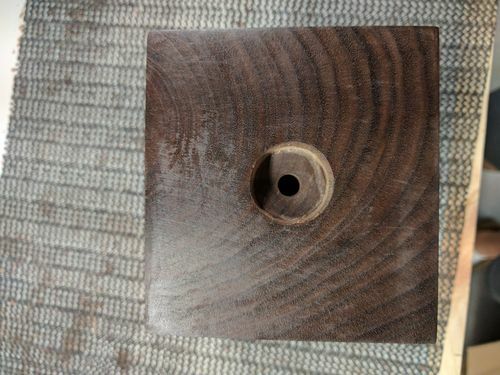 I was concerned if I sealed the end grain with something (probably shellac from what I’ve just read), I wouldn’t have the same color on the end grain that I do on the long grain. So at this point I guess I’ve committed myself to multiple coats until it stops absorbing. When you say “one coat” – do you mean just that? A single coat of finish, then let it dry etc etc? I too like the end grain to have a somewhat similar finish to the “flat” wood. I’ve never used “Arm R Seal” (not available here), but with oils and varnishes I just keep adding very thin coats of finish until it either stops absorbing, or starts to get sticky. Be careful when you get to the rub-down – it may take longer than 24 hours to harden up. This is to control blotching, conditioning the wood, but will work well for sealing end grain also. Can condition the entire piece then topcoat to get even absorption. For this project just keep adding ars coats. remedy I’ve found to work. remedy I ve found to work. What grit would you sand to? 220, or 320 if necessary.